Stephanie Zia joined the BBC at 16 and trained and worked as a production assistant, researcher and director on BBC TV arts documentaries. She began writing when she left the BBC to become a full-time mum. She took a beginner’s course in creative writing at Richmond Adult Community College where she later became a guest tutor. Author of 2 Piatkus commercial fiction novels and 2 Hamlyn non-fiction books, Stephanie has written for a variety of British publications. From 2005–11 she was the cleaning guru for The Guardian newspaper’s popular Space Solves column. Embracing the independent publishing revolution, Stephanie started Blackbird Digital Books in January 2010 to produce her first ebook Done & Dusted – The Organic Home On A Budget, her collected Guardian columns. Other titles include Ten Good Reasons To Lie About Your Age, a contemporary novel about a widow torn between ageing gracefully or disgracefully, Babe On Board a comedy about a single 40-year-old first-time mum, and her short story collection Made in China – A Fairy Tale For The Internet Age. She lives in London with her partner and teenage daughter. 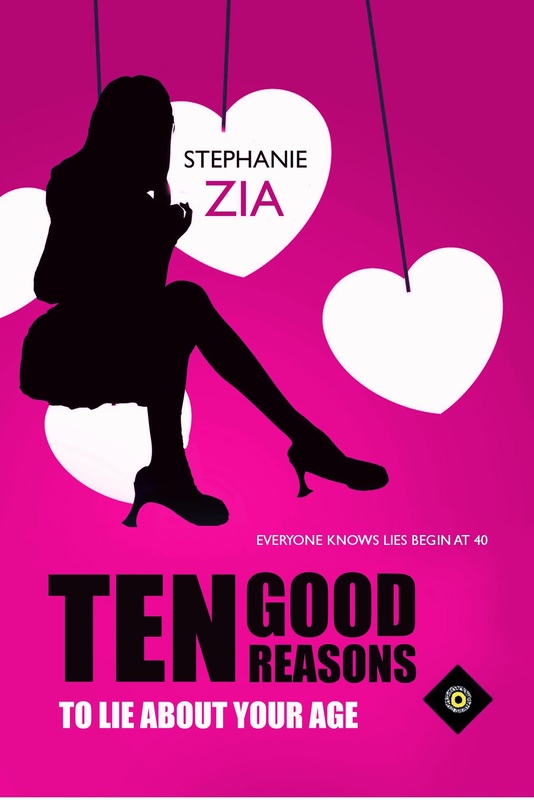 Huffington Post Books recommends Stephanie’s novel Ten Good Reasons To Lie About Your Age as an ideal book for reading and book clubs, calling it insightful and delightful, full of thoughtful dialogue and exceptional clarity. I left school at 15 and joined the BBC at 16 as a junior secretary. They used to promote all their staff in-house so over the years I gradually moved through the system to the place I wanted to be at: TV arts documentaries. I was very lucky and I loved my job, travelling the world helping directors make films about artists and writers. Though an avid reader, I didn’t think for a moment I would ever write or do anything creative myself. Then I worked on a film about new music in California and met a host of extraordinary artists including Frank Zappa, Terry Riley and John Cage. They showed me that creativity didn’t have a box round it with Not For You written on the outside. Having worked alongside creatives all my life I began to explore my own creativity for the very first time and, to my amazement, ended up directing BBC films instead of assisting. The films were fine but my lack of academic qualifications and my natural shyness didn’t get me very far. I was very frustrated for a while but then my partner bought me a beginner’s creative writing course as a birthday gift and that was it. I loved my beginner’s creative writing course so much I took it again the following year. Then I moved on to an advanced course. After writing short stories for 2 years, my first novel Babe on Board was started in that final third year class. I perfected the first 3 chapters and sent them, with a short synopsis, to 2 agents. One of those took me on, helping me shape and craft the whole novel. She then got me a 2 book deal at Piatkus, now part of Little, Brown. Discouragement goes with the territory. My own came in the shape of my 2nd novel not being liked by either my agent or the publisher. I was dropped by both and went back down the snake to Square One! I began a blog about my experiences: Confessions Of An Author, which was mainly about failure as I desperately tried to get my feet back in the stirrups again. I came very close, found a second agent and a publisher, but then it went belly-up again. The tone of the blog changed considerably when ebooks came along and I began to self-publish and sell my own work. Author: No music. No. But absolute quiet isn’t necessary, can ‘tune out’ of everyday sounds. Author: Getting the characters to come to life on the page is the biggest joy of it all. On a first draft I will do nothing but give them speech. Get them talking to each other and each voice and personality develops in its own way. That was an early lesson in my beginner’s creative writing class, getting the characters talking straight away. I then study the speech patterns as they develop and look for unusual speech ticks that can be repeated elsewhere to enhance the individuality of the person. In looks, eyes and light are important, the light in the eye. Plus air and wind, the way it plays on the hair, breathing – literally breathing – brings life to the page. I’m working on a novel about a film continuity girl who leaves the industry to go and live with a man she met whilst on location in Brazil. When she arrives she doesn’t find quite what she expected. I filmed in Brazil and continuity was one of my jobs. I loved Brazil so much and I nearly did go and live there. The news that Amazon Kindle is opening in Brazil later this year has inspired me to finish this novel I started many years ago when filming and the work that you have to do as a production assistant and continuity girl was still fresh in my mind. That they will be entertained but also moved by the extremes of the emotional journey that the main characters go through. Author: The extremes of the highs and lows. No matter what stage you’re at, once your books are published they go on a journey of ups and downs and you have to find a balance between the despair when things don’t go as you’d hoped and the excitement when they exceed all expectations. It’s a rollercoaster ride. Author: The rollercoaster ride. And being able to work anywhere at any time, even when you’re asleep the subconscious takes over in sorting storylines out. I find that side fascinating. Author: I’m now publishing other author’s books as well as my own at Blackbird Digital Books so have turned from an author into an author/editor/businesswoman. I’m enjoying it hugely. I have several commissions in the pipeline by new authors as well as more books on the way by the wonderful travel writer Susie Kelly. My goal is to get my books selling as well as Susie’s! As a writer I hope to return to my children’s fantasy novel which I spent about a year writing between agents and before ebooks arrived. The idea is solid but it needs a complete restructure. I’m looking forward to going back to that and reading it again with fresh eyes after so many years. From a variety of places. Sally Lightfoot the heroine of my latest novel Ten Good Reasons To Lie About Your Age - about a widow unsure whether to age gracefully or disgracefully – was named after a crab! They are mentioned quite often in one of my favorite books of all time, John Steinbecks The Log From The Sea Of Cortez . There’s a picture of the crab in that Wikipedia link about the book there. I gave her certain crab characteristics and a Cancer star-sign home-loving personality. Don’t look back. Don’t dwell on rejection or failure but learn from it and move on. Keep writing is the best advice I was ever given. That’s where the biggest joys will come from. It has to be the laugh out loud in public one. If I see someone on the train or subway who is looking at a book with a smile on their face I immediately want to know what that book is. I’ve never actually seen anybody laughing out loud though. My books have moved people to laugh out loud, they tell me, but also cry - which is an added bonus. So yes, laughing and crying, definitely. My latest books are listed at Blackbird Digital Books http://blackbird-digitalbooks.com/, all my books, ebook and paperback, are available on Amazon. Hey, Deirdra. It's been a while. I'm back from my blogging hiatus and catching up with everyone. Glad to see you're still here and writing.